Can someone explain to new LP collectors what a DEEP GROOVE pressing is? Discussion in 'Music Corner' started by Steve Hoffman, Apr 16, 2008. I don't have time right now and people keep asking. It has NOTHING to do with how the record is cut. It's something that appears in the actual label area of the record and is a byproduct of manufacturing. The deep groove in the label has NOTHING to do with sound quality, just a pressing plant thing... , Blue Note never owned a record pressing machine. They used the presses of the cheapo Plastylite company. W.B. and others, please chime in, gotta run..
At least that's what I've always called a "deep groove", it's under the label and doesn't have anything to do with "music grooves". To me it was just a sign of an older pressing then the same album without one. According to my Goldmine Book on Jazz, Bluenote used the deep groove on the label until 1960 to designate the first pressings of an album. Some other lables followed suit. I'm not sure if Bluenote started this idea or not. So whereas it doesn't make a record sound better, having a first pressing can indicate a better sounding record compared to later pressings. This isn't always the case of course. All it designates to me is that a certain type of record press was used; it's not deliberate. Many first presses are DG, but that's just because they're early and use that sort of press. The Deep Groove is an artifact of the screw-in block that holds a stamper in place in the record press. A stamper has a large center hole, and the screw-in allows the stamper to be centered. While they were, in general, in use earlier many pressings from the late 60s (e.g. Zappa's Freak Out) seem to exist in 'first pressing' form with both flat and DG labels. At least, the discs and covers are identical except for the DG. Boy, that Goldmine Book on Jazz couldn't be more wrong. Where do they come up with these fairy tales? Funny, I was always told to stay away from the Deep Groove records because they were the products of the really early modded 12" 33 1/3 RPM stamping machines and were very low tech. I mean, Blue Note chose the cheapest plant they could find. Nothing to do with anything but saving money on pressings! Now, they are revered. I guess if they have the groove it means a first pressing, I can understand that but geez. Up until 1960 Blue Note record pressing machine produced a deep groove in the label -- for pictures of which, see above. At this point, they were using labels that had "47 West 63rd." Their earlier label -- used until 1957 -- had a "Lexington Ave." address on it. They then bought new equipment in mid 1960 and first used it for Blue Note 4059 (Undercurrent, Kenny Drew). In fact, the original of this has deep groove on one side, not the other. This matters because Blue Note would sometimes re-use labels, even once they had moved. So just because it says "47 West 63rd" on the label does not mean it is necessarily early -- it could be a reused label. But it is not so simple as deep-groove means earlier -- you will find deep-grooves with NY label (starting in 1962) -- because they kept their old equipment even once they had the new equipment. But the first pressings before 4059 were with the deep-groove machine and the first pressing after 4059 were NOT with the deep-groove machine. They used the new equipment for first pressings. So a deep-groove after 4059 is likely to sound worse. All this matters because the earlier 1950's pressings tend to sound best. I have what looks like a really beaten up Jimmy Smith "A New Star, A New Sound vol. 2" on the Lexington ave label (with deep groove), and it is my most amazing organ recording. It is really special all around (the guitar emerges in a beautiful way and the organ has this amazing presence in the room). Like I mentioned above, Blue Note never owned a record pressing machine. They used the presses of the cheapo Plastylite company. That makes sense. I knew they were pressed at Plastylite -- but had also read that they owned the machines and never deduced that they couldn't have. I believe the rest of that should be accurate, but would be quite happy to be corrected. Funny, I was always told to stay away from the Deep Groove records because they were the products of the really early 12" 33 1/3 RPM stamping machines and were very low tech. I mean, Blue Note chose the cheapest plant they could find. Nothing to do with anything but saving money on pressings! Now, they are revered. I guess if they have the groove it means a first pressing, I can understand that but geez. Why don't you ask Tim Neely? Tiiiiiimmmm, fix the thing, willya? As retold, this legend is indeed neat, the truth (while accurate) is boring..
You can buy the guide for $5 on Goldmine's website. I emailed to ask about this and was just told that a new edition is not coming out and that it was being remaindered. If true, that's quite sad. Despite some factual inaccuracies, it is a very helpful guide. After hitting the bong you put on some Isaac Hayes and everybody starts snappin' their fingers and next thing you know you’re in a "Deep Grove"
The Beave, BroX, ArpMoog and 1 other person like this. First of all, Six String misinterpreted what I wrote. I got it right; the "deep groove" on a Blue Note LP shows that the record was pressed at a particular pressing plant that just happened to conicide with the first editions of the label's early albums. It's a way for a collector (who may or may not care about sound quality) to discern an early pressing of a Blue Note album. No other label inspires such passion among jazz album collectors as Blue Note. In some cases, even the most minute of label difference can mean a lot. 1951-57 (all original 10-inch LPs, and 12-inch LPs numbered 1200 and 1501 to about 1543): White label with blue print, "33 1/3 Microgroove Long Playing" in large print along the edge of the label from about 11 o'clock to about 4 o'clock, with "Blue Note Records 767 Lexington Ave. NYC" underneath that. All Blue Note LPs with this label are in mono. The earliest of these records, especially in the 10-inch series, do not have a so-called "groove guard" along the edge of the LP, as later pressings do. The highly collectible issues that do have the raised edge also have what is known as a "deep groove" in both sides of the record, visible on the label between the words "33 1/3 Microgroove Long Playing" and "Blue Note Records 767 Lexington Ave. NYC". "Blue Note Records -- 47 West 63rd -- New York 23"
"Blue Note Records -- 47 West 63rd -- NYC"
"Blue Note Records Inc. -- 47 West 63rd -- NYC"
Stereo records also exist on this label; these say "33 1/3 Stereo Long Playing" in large print along the edge of the label from about 11 o'clock to about 4 o'clock. Most West 63rd issues, like the earlier Lexington Ave. editions, feature the "deep groove" in the label area. Known anomalies: Some records exist with the Lexington Ave. address on one side and the West 63rd address on the other; these get the West 63rd prices. As best as can be ascertained, no Blue Note labels ever used the "43 West 61st St. New York" on them, though covers did. Copies of this cover address have been found with records containing West 63rd labels, "New York, USA" labels, even "A Division of Liberty Records, Inc." labels. 1962-66 (from about 4101 to about 4252, including stereo equivalents in the 84000 series): White label with blue print, "33 1/3 Microgroove Long Playing" or "33 1/3 Stereo Long Playing" in large print along the edge of the label from about 11 o'clock to about 4 o'clock, with "Blue Note Records Inc. -- New York, USA" underneath that. Most "New York, USA" issues, like the earlier Lexington Ave. and West 63rd editions, feature the "deep groove" in the label area. But because many of these are first re-pressings of Lexington Ave. or West 63rd editions, these versions do not bring as much as their earlier counterparts. Known anomalies: Some later editions with this label have a small registered trademark symbol under the letter "E" of the word "NOTE" on the label. These are not common, but they seem to bring less than copies that don't have the (R) symbol on the label. I also went on to describe Liberty, Liberty/UA, United Artists, Capitol/EMI, Classic Records and even Japanese Blue Note reissue editions. You get the idea. Just as is the desirability of mono Blue Notes over stereo Blue Notes, the desirability of first pressings is yet another clash between the collector and the audiophile. For collectors, the first pressing is (usually) the most valuable and sought-after; for audiophiles, it's the one that sounds best, whether it was pressed in 1958 or 2008. The weird crud on the scans is my scanner! Eek..I need to clean that thing! I apologize for the misinterpretation but here is what I have in my second ed. of the Goldmine Book on Jazz that made me believe what I said. 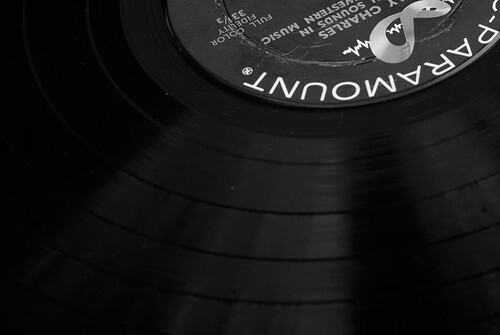 were originally pressed with what is referred to as a "deep groove label."" I can see now where I misinterpreted the sentence. So Bluenote didn't do this to identify first pressings (how would they have known these records would become so collectable), but collectors now use deep groove labels to identify first pressings in those early series of records. How is my wording now? Your wording is fine. I think you'll find that pretty much any blue note deep groove is collectible. People just look for deep groove. As you say, after 4050 this does not indicate a first pressing (and I've read that it positively indicates a second pressing). BUT, if you just are looking for collectible -- or, more specifically, sellable -- a later deep groove might be worth more. People see the word "deep groove" with Blue Note and think "good." Steve: can I ask what made Plastylite cheapo? Those early pressings do seem to sound awfully good, on really thick nice vinyl. Funny we were just discussing this on my Beatles 2-box thread (I know, this is a one box). Parlophone "two-box" Beatles album questions. This one is from an Israeli seller, and it doesn't state where it was pressed. Israel? I only collect music that I like so whether it has a DG on the lable or not doesn't change my feelings about the record. Unfortunately as you say, people see a DG and the price goes up automatically. I'm not willing to spend large sums of cash on an lp and it will be a long time or a very serious situation before I sell off my Bluenote records. As I said, I collect music I like to listen to and I just happen to love the Blue Note sound. Those albums never fail to get my foot tappin'. Well, maybe not the Cecil Taylor albums, but you know what I mean. To me (and I don't collect Blue Notes so I'm not an expert) if it has the RVG in the leadout groove, it's a good cutting no matter what pressing plant makes the record. Like any other record, it's who cut it that makes the most difference.. I'm sure the pressings are fine, the ones I've heard are nice. Cheapo to me means the cheapest out there without sacrificing quality. In other words, if you're a little record company you shop around for the best deal. Heck, at DCC we did the same thing. All little companies do, it's only logical. And when the pressing order is small (like the Blue Notes) it doesn't make sense to move around. DCC would change plants as new ones (with better deals) came into being. Only the 24k Gold CD series had a built in deal breaker; in other words, other than Superior Disk, Japan, Nimbus or Sanyo, USA, there were NO plants that could make an authentic Gold CD so we were stuck.